The number of reported incidents of road rage has been on the increase over the past few years. 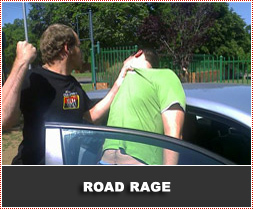 Road rage has become a major threat to safe driving and is being investigated by the MRC-UNISA Crime, Violence & Injury Lead Programme together with the Accident Research Centre at the University of Natal. Road Rage has been described by Sally Davies, a clinical psychologist, as a social problem that appears to be increasing all over the world along with traffic congestion and levels of frustration on roads. Road rage occurs when people who are already vulnerable to aggressive outbursts are led to express their rage and - more critically - direct it towards total strangers. Davies says that from behind the wheel, it is so easy to personalize relationships on the road. We find ourselves in a position of power and safety, free to insult other drivers verbally, make moves that restrict or obstruct them, make aggressive gestures with hands, flash our lights, sound our horns, or otherwise act out fantasies of being "in charge" - as if we had been appointed Road Monitor! There appears to be various reasons for extreme rage. Some people who have a prior history of "blowing their top" might have mental disorders, assaulting others or destroying property owing to rage. There are also other antisocial personalities, those who abuse drugs and alcohol or just your everyday motorist who is psychologically ripe for road rage. There is absolutely no point in antagonizing any one of these people - no matter what right you think you might have. It is just not worth it! As motorists we all have a responsibility and numerous opportunities to cool the emotional temperature on the roads. Every small act of road courtesy, of giving way, a smile or gracious 'thank you' wave, making positive eye contact before you join a line, contributes to harmony. Defensive driving is more than just a mental attitude and there are specific techniques that might assist the motorist in avoiding road rage and also steps to be taken when falling victim to such an attack.